Porsche Cayman GT4 Clubsport is a race car introduced by the German sports car manufacturer at the end of 2015 and prepared to boost up Porsche Motorsport’s customer program starting with 2016 season. Cayman GT4 CS is in use all over the world in different GT and endurance competitions as an affordable entry-level car both for beginners and accomplished drivers. Porsche waited almost ten years from the introduction of Cayman in 2006 to converting it into a race car. 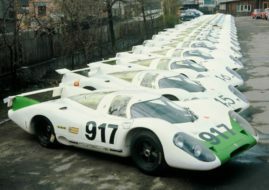 For decades, Porsche 911 was one of the most popular race cars in the world and the sole representative of the Weissach-based company in GT racing. Finally, in 2015, 911’s little brother was equipped with a roll-cage and other racing equipment, prepared to hit the track all around the globe. The Cayman GT4 Clubsport was based on the street-legal Cayman GT4 (factory name Type 981). Both road and racing versions feature flat-six-cylinder 3.8-litre boxer engine. The main difference is the gearbox, as regular GT4 has manual gearbox while GT4 Clubsport is equipped with a 6-speed Porsche Doppelkupplung (PDK) gearbox with optimized shift application. Of course, the rest of a car is also extensively modified to fit FIA regulations, getting racing differential with mechanical rear differential lock, racing brakes, racing Michelin tires, racing suspension with modified wishbone from 911 GT3 Cup, fixed carbon rear wing, OMP race bucket seat… The price of such a car was $165,000. Porsche Cayman GT4 Clubsport had its world premiere at 2015 Los Angeles Auto Show, what proved that German company wants to take a big bite in the customer racing on the North American soil, where a car was eligible for different competitions, such are Pirelli World Challenge, Continental Tire Sports Car Challenge and Porsche Club of America events. In Europe, Cayman GT4 CS was the most popular, of course, in Germany. Cayman’s main playground is the Nürburgring Nordschleife and the main competition is the VLN Endurance Series, which has ten events throughout a year on the famous Green Hell. At the Nürburgring 24-hour race, the best placed Cayman GT4 CS was Manthey Racing’s car in the 23rd place overall and the winner of SPX class. The number of cars was constantly growing up during 2016, so for the 2017 VLN season, a new Cayman GT4 Trophy by Manthey-Racing was established. Some other competitions in which Cayman GT4 Clubsport was represented during its first year were GT4 European Series, 24H Series or British GT Championship.